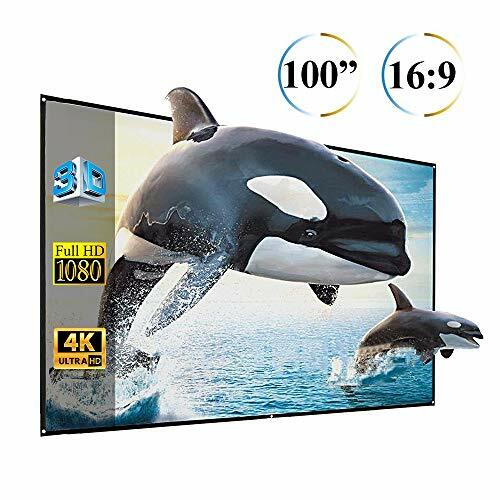 100" 16:9 portable projector screens for you to display movies, video games, or presentations, PPT, photos, perfect for home cinema, teaching, public display,meeting and conference etc. 1. If there are some wrinkles after you roll the screen up, if you have a hair dryer, put it on low heat and high fan and keep distance to warm specific areas. Or let it hand in the window during the day with sun shining through it would also help. 【Portable & Lightweight】Made of 100% Matte White PVC. Specification: widescreen 100 inch, 16:9 screen format, screen size: 125 x 220 cm / 49.21 x 86.61 inch. The projector screen is lightweight, anti-wrinkle, foldable and easy to carry around. Screen will not turn yellow for long term use. 【Optimize Image Quality】1.1 gain. Provides an exceptionally wide viewing angle at 160 degrees with no resolution loss at any viewing angle, the color revivification degree is extremely good. Features black backing, which can effectively eliminate light penetration. Just enjoy wider angle viewing and more natural images with accurate colors! 【Easy to Install】Suitable for both Wall and Ceiling mounting needs. There are 6 precise holes for installation. The Projection Screen can be fastened easily with hooks, ropes, bracket, nails, double side tape on the wall. 【Easy to Clean】The screen is damp-proof, anti-mildew and flame retardant. The screen surface can be easily cleaned with mild soap water. Well packaged in rolls professionally. 【Wide Compatibility】High quality screens for LED, LCD, or DLP projectors. Ideal for home cinema, meeting, conference, public display or classroom presentation, gaming, outdoor movie, etc. The delivery just takes 2-4 days. Friendly customer service, 30 days return guarantee. If you have any questions about this product by CAIWEI, contact us by completing and submitting the form below. If you are looking for a specif part number, please include it with your message.